The Fujino Soft Tenkara Long Type is a hi-vis tapered nylon tenkara line that comes in 7, 8, 9, and 10m lengths. Even if you don't fish with long lines, it is excellent for casting practice. I prefer fishing with a short line, and I generally fish with fluorocarbon rather than nylon. I find fluorocarbon easier to cast and it's still light enough to hold off the water's surface. That said, nylon does have a couple advantages. 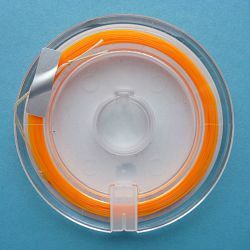 Nylon is easier to dye a very brightly color and since nylon is less dense than fluorocarbon it can be made to float if greased with a paste floatant. The lower density of nylon also makes it a great training and practice line. My first exposure to casting a long nylon line came at the recent Oni School organized by the Tenkara Guides in Salt Lake City, UT. At the school, Masami Sakakibara (Tenkara no Oni) demonstrated his long line ability with a 10 meter nylon line. 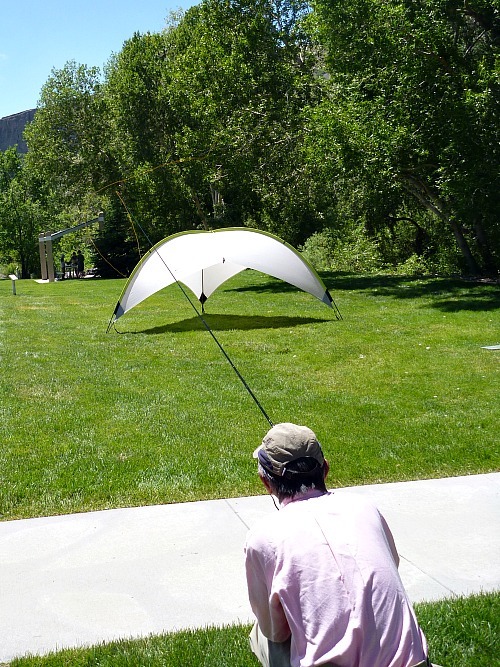 Using a 3.6m Nissin Royal Stage Tenkara rod he was casting a 10m line into the opening of a suntent. It was hard to photograph but very impressive to watch. The students then tried do cast the long line. No one could do it until he gave the student specific guidance. With his coaching, though, we were able to cast the 10m line. The bright orange color makes the line quite visible even at a distance. The extremely long nylon line is a valuable tool for evaluating your casting form. If your form isn't good, you won't be able to cast it. By watching your back cast and modifying your speed, rod angle, timing and amount of power applied to the forward cast, etc, you should be able to gradually improve your performance. As a training tool, the lower density is a positive attribute. Your really do need good form to cast the line well. 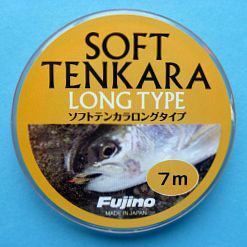 I'm not sure I'll ever fish with the Fujino Soft Tenkara Long Type lines - although I might fish the 7m line and my 6.3 and 6.4m keiryu rods. I will use them for casting practice, though. For people who do like to fish with long lines these are the long lines that Tenkara no Oni had for demonstration, for teaching and for sale at the Oni School.